We’d love your help. Let us know what’s wrong with this preview of The Longest Night of Charlie Noon by Christopher Edge. Secrets, spies or maybe even a monster… What lies in the heart of the wood? Charlie, Dizzy and Johnny are determined to discover the truth, but when night falls without warning they find themselves trapped in a nightmare. Lost in the woods, strange dangers and impossible puzzles lurk in the shadows. As time plays tricks, can Charlie solve this mystery and find a way out of the woods? But what if this night never ends…? 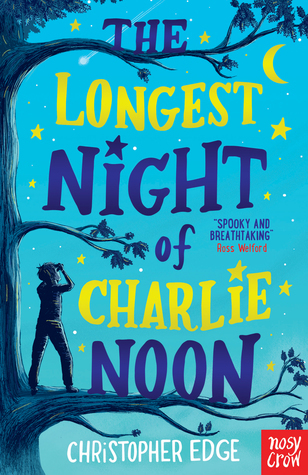 To ask other readers questions about The Longest Night of Charlie Noon, please sign up. Atmospheric, intelligent and thought-provoking, this is the kind of story that leaps out and yells 'surprise!' every time you feel sure you have a handle on it. Three children get lost in the woods and desperately try to help each other to find their way home before the legendary Old Crony - who they say eats children - makes an appearance. Tapping into the natural world around them and putting their code-cracking know how to good use, the children find clues in the rhythm of birdsong and shapes o Atmospheric, intelligent and thought-provoking, this is the kind of story that leaps out and yells 'surprise!' every time you feel sure you have a handle on it. Tapping into the natural world around them and putting their code-cracking know how to good use, the children find clues in the rhythm of birdsong and shapes of the sticks on the floor. Suspense builds with every page and the usual rules of time seem to become increasingly distorted as the story progresses. Once again, Christopher Edge weaves science and philosophy into a gripping child-centred story that keeps the reader guessing and puzzling until the very end. A wonderful read that builds suspense from the get-go. Charlie and Dizzy get lost in the woods, after following what they believe to be secret messages on the forest’s floor. As they try to fathom what they’re being told, a darkness descends: darker than any darkness Charlie has experiences before. Every chapter left me wanting to know what was to come next, as people go missing, noises are heard, and the darkness continues to grow. Charlie’s experience in the woods is a life-changing one, as th A wonderful read that builds suspense from the get-go. Charlie’s experience in the woods is a life-changing one, as the rules of time are bent completely out of shape. A story of nature watching over the world as it shifts and changes; one that casts a light on what is meant by courage, friendship and bravery; and one that is about somebody being able to find themselves. Christopher Edge somehow seamlessly blends suspense, mystery, code-breaking, sci-fi and even a splash of Ancient Greek mythology without missing a step. Mind-bending in the absolute best way, this is yet another triumph from Christopher Edge. The story starts with three children going into the woods behind their school to look at what appears to be a message in code. Then strange things start happening, the path is lost and it gets dark. Can they find their way home, when even the moon and stars seem to have changed above them? Each chapter builds suspense and I found myself reading faster and faster as it hurtled towards a conclusion. The blend of Mind-bending in the absolute best way, this is yet another triumph from Christopher Edge. The blend of science, philosopy and history, paired with characters who you instantly care about, makes this a winner, particularly for any readrrs (young or old!) who have enjoyed Christopher's previous books. The author's notes at the end give more information about the inspiration behind the book and made me want to read it all over again! Thank you so much to Nosy Crow for my proof copy -everyone else look out for this in June! Charlie has moved from London to the countryside and is struggling to fit in. Dizzy isn't interested in school, preferring to be outside in nature, observing and watching. Johnny is a bit of a bully and teases both Charlie and Dizzy. When all three get lost in the woods, they have to rely on each other to find the way home. But strange things keep happening, messages are being left for them, paths disappear and the legend of Old Crony, who eats children, is on all their minds. Another wonderful b Charlie has moved from London to the countryside and is struggling to fit in. Dizzy isn't interested in school, preferring to be outside in nature, observing and watching. Johnny is a bit of a bully and teases both Charlie and Dizzy. When all three get lost in the woods, they have to rely on each other to find the way home. But strange things keep happening, messages are being left for them, paths disappear and the legend of Old Crony, who eats children, is on all their minds. A mind-blowing, heart-stopping, dimension-defying dash through time that thrums with tantalising twists & leaves you completely breathless. With a nod to WW2 in this masterclass in mixing suspense & science; this is Edge at his most edgiest.